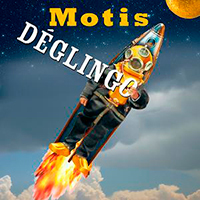 Motis is the project of Emmanuel Tissot. This French band is active since the year 2000. The band already released 6 studio albums and 5 live albums. So this “Deglingo“ album is their seventh studio album. Because of the French vocals and the theatrical character of their music the band has a kind of Ange connection. When I heard that Ange vocalist Christian Déscamps was one of the guests who participated on this album, I immediately asked the band for a promo copy. The album has been released on the French Musea label. On “Deglingo“ you will find eleven songs with a duration of between 3 and 7 minutes. The first thing I noticed is that the music of Motis is more songmatically of character. Don’t expect long symphonic or progressive epics. But there are progressive elements in the music. Especially if you look at the instrumentation. You will find a lot of analog synthesizers, Hammond and lovely Mellotron strings in the music. Just listen to the Mellotron strings in the songs like “Cavale“ or “Peut-être“. The second thing I noticed is that the voice of Emmanuel Tissot has a slight resemblance to the voice of vocalist of the also French band Lazuli. Or is this only due to the French language and the theatrical way of singing? I think it has more to do with the way of singing. Maybe it is the other way around and is the vocalist of Lazuli influenced by the vocalists of Ange and Motis. Besides the theatrical vocals the band also uses sound effects and soundscapes to enrich the storytelling character of the songs. When I was listening to the song “La Distance“ I had a kind of Deja Vu feeling. In the opening there is an organ sounds that reminds me of the Interview album of one of my favorite progressive rock groups of all time ... Gentle Giant. Of course this could be a coincidence. In any case, you can enjoy beautiful organ play in the song “La Distance“. A song like the title track “Deglingo“ is more rock oriented. Delphine Tissot is the vocal guest on “L’appel des Vents“. You will find a nice duet on this song. The following song “Nature“ has beautiful vocal refrains with some great melodies. And then it is time for the song with the collaboration of one of my heroes. Sadly this is also the shortest song of the album. Ange vocalist Christian Déscamps is singing a duet together with Emmanuel Tissot. Musically speaking the music has some folklore influences that reminds me of the music of Ange. The last two songs “Mars“ and “L’effet“ overview are more uptempo. Especially the album closer “Mars“ and “L’effet“ is interesting for the lovers of progressive rock. With 7 minutes this is the longest track of the album. An instrumental song which has the so needed diversity. Lovers of the Hammond organ will love this song. For me personally it is one of the highlights of this fine album. Well thanks to the short guest appearance of Ange vocalist Christian Déscamps I got the opportunity to discover the music of Motis. To be honest this album is more songmatically oriented as I expected but I still enjoyed it. Emmanuel Tissot impressed me with nice vocal performances and some great keyboard playing. You can find some lovely Mellotron strings and great Hammond organ playing on this album.